Question / Help Downmix to Mono = 50%? i just tried OBS Studio and wehen i used the normal OBS, I just clicked "Force Microphone to Mono" and everything was fine. 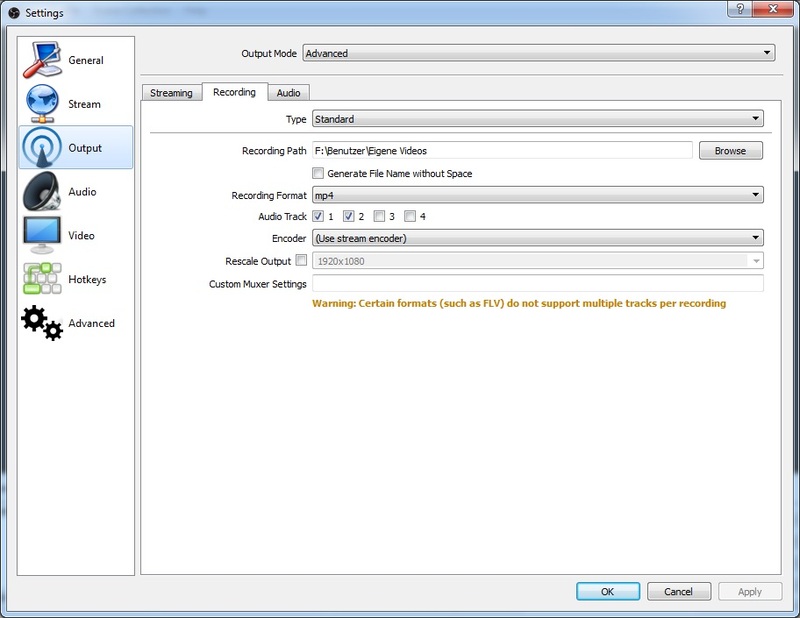 In OBS Studio I have to set the Mic Volume to 200% to get the normal Sound, when clicking "downmix to mono". So I'm losing quality to that. Is there a way to fix this? Or is this normal? And what? Your OBS Studio outputs to Mono?! Why does OBS Studio lower the volume of the mic, when forcing to mono and why doesnt the normal OBS do this? And shouldnt be my Edirol UA-25EX be able to to fix this? There is setting Downmix to Mono at Advanced Audio Properties, I think, this option is not transparent for understanding. Because it always accessible (visible). It is not transparent what it would 'downmix', if source is Stereo (L, R) and output is Stereo (L, R) too, --> L+ R and double result to L and R channels? I understand "downmix to mono" as Stereo (2.0) to Mono signal conversion or Multi-channel to Mono signal conversion. I think, settings need to be renamed. In current Studio build, the AAC sound recording uses "Stereo" mp4 container's info regardless of setting Settings>Audio>Channels or Downmix to Mono. Actual number of channels is defined by Settings>Audio>Cannels. And what doing Downmix to Mono - only god knows. Maybe feature incomplete. On my system it reduces volume level for Mic/Aux device too ^_^ It is clearly seen: when you checking the Downmix to Mono - green level bar drops a little (you need a test sound, or you must speak with constant loudness :), and when you unckecking this checkbox - green level bar returns in a few dB up, showing loud sound. I suggest to avoid Downmix to Mono setting until you really need it (maybe in case of Settings>Audio>Channels: Mono and stereo input it do something good or so). I think it would maybe make more sense to be able to just record from one of the channels of that particular input, if it's stereo? For example, my microphone goes through a mixerboard, which sends a group out back to my soundcard. So the input I get is L/R but it's the same signal on both L and R. Now when recording microphone, these kind of microphones anyway, they are by nature mono. So "stereo" isn't something you would want to use on that track. So maybe a setting to specify an input as mono in addition to the downmix to mono. Anyway, since the basic formula is M = L / 2 + R / 2, I'm thinking if you have an input which only sends on one of the channels, and you downmix to mono, the volume would logically be lower. Where as in my case, I have the same signal on both channels, I don't notice any difference. And then? How your 'M' becomes stereo at output? Goes to Left only, to Right only, or double? Well, admittedly, I'm no advanced user of ffmpeg and I can't really look things up either since my ISP decided to accidentally shut down my internet before the weekend. OK. I went deep into the code and events. // and if Channels_number = 0, how to divide? Maybe it is impossible event? It can be applied when we are output to mono and using Downmix_to_mono setting (there is some code obfuscation with mono_output, but I think it intended to run as I wrote, I may wrong of course...). But then, why we are counting channels in last assignment if we are output single one? Code using float to calculate samples, so there is no flaw in this part. I see level down a bit. I hear volume down a bit. I'm using stereo. In my logs "FFmpeg aac encoder" always says "channels: 0" (Win7), but I saw that it can hold "channels: 2" (Win10 users logs). I dont really understand all the technical aspects and my english is also too bad for it, but why is it working in the normal/old OBS and in the Studio Version it isn't really working. My Mic is a Rode NT1-A and i'm using a Edirol UA-25EX Audio-Interface. And when I'm recording with Audacity in Stereo, only the left channel has Sound in it. Maybe because the XLR-Cable is plugged in "Input1/L"? So is there a way, to avoid the volume drop in OBS Studio by the program itself or can i avoid it by doing something to the Mic/Interface driver? Why OBS and OBS Studio is different for you is because the code base is different. And from just a quick look seems to be quite a different path. My uneducated guess without digging through all the sources is that somewhere along the way in OBS Classic by either OBS itself or the frameworks it was using, a muted/dead/silent channel gets detected and dealt with. And this doesn't happen now. * I'm not too familiar with your audio interface, but it seems to have a mono button. Try pressing/depressing it and see if that changes anything (for example while recording in audacity, maybe you see that you get L/R in one mode). Other than that it doesn't seem to have any control software, which is a shame. * Shouldn't that work or make no effect at all then take a look in Windows Sound Manager under Recording Devices and see if there is a mode you can switch to that makes it mono or at least voice in L/R. If you're lucky the option is there and then you don't have to use down-mix to mono in OBS as it will detect the lonely channel. * If Sound Manager doesn't get you there, then you could try out VoiceMeeter (http://vb-audio.pagesperso-orange.fr/Voicemeeter/). I haven't tried it out myself since I use a hardware mixer, but I've seen it quite a lot recently and being recommended by streamers on twitch and youtubers. It's donationware so worth checking it out and it will definitely do what you want. Can you both post a log-files with recording attempts? To make sure that "channels: 0" is the Win7 related log message. Maybe name: Mix to Planar is better than Downmix to Mono? At least, it doubles average data to both channels. at Steve Macintosh, You'll never know, is the one channel is a noise or zero channel. And there is nothing wrong - single speaker is quieter than two. If you are simply copy one channel to another (what we are expecting from Studio and other software when we are working with the mono mic and stereo output) then your sound should be heard louder (like two speakers). That's why you use ASIO drivers. @m0m0, It's from streaming, the message appear at recording only. And it doesn't matter are you checked Downmix to Mono or not (for any track). Can you post a new log with recording attempt? Multi-track recording with mic in one track and other sounds in other track is welcomed (You may select Downmix to Mono for mic track, it doesn't matter for log-file).
" [FFmpeg aac encoder: 'simple_aac'] bitrate: 160, channels: 0 "
FFmpeg aac encoder under Win10 says channels: 2. Maybe it do nothing, because sound is OK in my recordings, but who knows. So my best solution is to boost the mic to 200%? Or can i do something with the ASIO drivers or a new Audio-Interface? Of course, you'll can wait for special setting to be implemented in Studio, that will allow to copy L -> R or R -> L channels or introduce special simple mix L=L+R and R=L for mono line-in. In case of delay fight, you can try to delay all other sources to maintain whole scene in sync (maybe set offset +/- , if possible in Advanced Audio Properties). But the way you got this delay says to me that this is not right solution.